Get your shoulders in peak shape with bodybuilding legend, Ric Drasin. 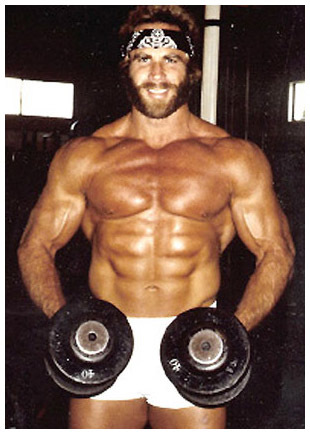 Back in the day it was a rule that the shoulders should be much wider than the waist in order to form that V taper. This was the goal of every bodybuilder. This is what all of us strived for and it took a lot of work because genetics weren’t so kind to everyone equally. Structure plays an important part as some people are just born with naturally wide shoulders and small waist. I don’t have a with a wide waist, but I do have large abs and they have a tendency to grow big, which makes my waist look larger. Arnold has sloping shoulders, so he had to work hard to bring up his lateral delts in order to broaden the appearance of his shoulders. Keeping the waist slim and tight to offset shoulder development is also tricky because you can work your abs so hard, (like I did mine) that they get thick and overshadow the width of the shoulders. One exercise I tell everyone NOT to do is side bends with weights. This also widens the oblique muscles around the waist and even though you think you’re reducing it, it’s actually getting bigger. However, wide shoulders can be achieved if approached properly. Years ago it was thought that the behind-the-neck press was the best way to develop the delts. We all did them and there was a guy in our gym that could actually do them with 315 lbs. That’s really strong, and he was thick and big, but his waist was twice the width of his shoulders. Over the years it was discovered that this exercise caused a lot of shoulder problems and arthritis because of its unnatural movement. At this point in my life I can’t even get my left arm back to grab the bar from doing these for so long. Many of us found alternative exercises to do in place of it though, such as the standing press with a bar, alternate dumbbell presses and Smith machine presses. Basically, the pressing movements added thickness and size but didn’t do a whole lot for the shape of the muscle. There are three heads, ‘anterior (front), ‘posterior’ (back), and ‘lateral’ (side). Each one has to be specifically worked separately in order to get maximum size out of it. Standing laterals are for the side, bent over laterals for the rear, and front raises for the front, but the bench press also works the front and sometimes will increase the size ratio to the back, so be careful and work them evenly.